Also reported earlier on this blog entitled “Barnett Shale Gas Drilling Contributes to Air Pollution,” WFAA-TV’s March 12, 2009 telecast interviewed SMU professor Armendariz and gas industry spokesmen about the professor’s claim that gas drilling pollutes as much as all cars and trucks in the metroplex. As reported earlier on the bqlc.org blog, The Endocrine Disruption Exchange (TEDX) is a good source of information related to endocrine disruption—health and environmental problems caused by low-dose exposure to chemicals that interfere with child development and function. Contrary to the propaganda of the oil and gas industry, data is presented that refutes this industry’s misinformation. Air pollution from natural gas drilling in the Barnett Shale produces nearly as much air pollution as all the cars and trucks in the Metroplex, reports the Fort Worth Star-Telegram. According to a study by , pollution from the 7,700 wells is centered on the highly populated area. However, the researchers say the pollution can be easily controlled with existing technology. Nearly 10,000 producing gas wells have been drilled in the Barnett Shale region and thousands more have been permitted by the Texas Railroad Commission. In Fort Worth alone, over 1,000 natural gas wells have been drilled inside the city limits within the past three years, dramatically increasing air pollution by at least three-fold, according to a peer-reviewed study by Dr. Al Armendariz, of Southern Methodist University. As he pointed out in a recent lecture, Barnett Shale drilling activities are the largest source of smog (NOx and VOC), greenhouse gases and air toxic compounds in North Central Texas. Although gas drilling companies keep their fracturing “formulas” private, the Pennsylvania Department of Environment Protection supplied a list of chemicals used in the process. Any of these chemicals may be present in wastewater generated and are stored temporarily in open pits at the drilling site. The Fort Worth Star Telegram reported on December 4, 2008 that the number of drilling rigs working in the Barnett Shale has fallen to its lowest level in about two years as energy companies pull back in the face of lower natural gas prices. The Endocrine Disruption Exchange, Inc. (TEDX) is the only international organization that focuses primarily on the human health and environmental problems caused by low-dose and/or ambient exposure to chemicals that interfere with development and function, called endocrine disruptors. TEDX’s work focuses on the endocrine system, which is the exquisitely balanced system of glands and hormones that regulates such vital functions as body growth, response to stress, sexual development and behavior, production and utilization of insulin, rate of metabolism, intelligence and behavior. Their research was designed to explore the health effects of the products and chemicals used in drilling, fracturing (frac’ing, or stimulation), recovery and delivery of natural gas. TEDX’s website http://www.endocrinedisruption.com/ provides a glimpse at the pattern(s) of possible health hazards for those living in proximity to gas development. In the process of researching the literature, they discovered that drilling companies have access to hundreds of products, the components of which are in many cases unavailable for public scrutiny. Their research papers cover oil and natural gas development in Colorado, Montana, New Mexico, Washington and Wyoming. For example, their report about gas development in Washington claimed that 68 products used in gas production contained at least 88 chemicals. All of these products have adverse health effects. Gas Drilling 101 – This is a handy step-by-step of the drilling process, provided by the Denton Record-Chronicle. Get the facts about oil and natural gas pollution. Flower Mound’s official website with information about oil and gas ordinances. The Oil and Gas Accountability Project (OGAP) helps communities protect both private and public land. Click here to find out how. OGAP also has a comprehensive guidebook for home- and land-owners. Think you’re not affected? 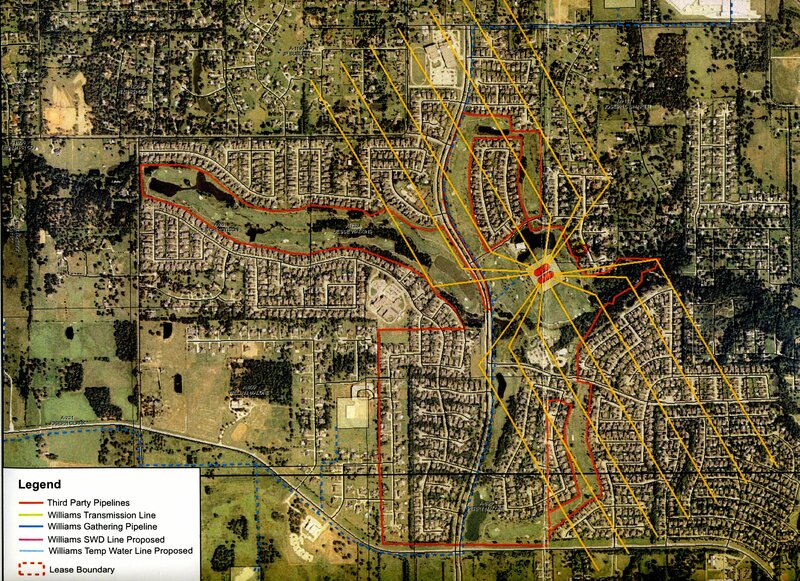 Click to open the map of proposed drilling on the Bridlewood Golf Course. We have felt the pollution and seen it in Clearville, PA. Pennsylvania residents need educated as well as those who enact laws which will pollute Pennsylvania’s air, water and soils. Too many laws passed by those who hear the good side of what natural gas production. What is missing in this reply from a PA State Representative, and how would you reply to it?